Agriculture remains the mainstay of country’s economy and a source of livelihood for the majority of the population, the bulk of which lives in rural areas. About 49% of the country’s total land area is under forests and woodlands while 27% is cultivated. More forests and woodlands are giving way to cropping and pasture compared to any other land use. Large scale infrastructural developments and the expansion of settlements contribute to deforestation, land degradation and habitat fragmentation. For example, between 1984 and 2013, Harare’s built-up areas increased from 12.6% to 36.3% of the city’s total land area. This has contributed to the establishment of infrastructure such as houses in inappropriate areas like wetlands resulting in biodiversity loss and land degradation. Human settlements and infrastructural developments also affect traditional wildlife migratory routes and lead to human wildlife conflict (HWC) as the wildlife destroys crops and infrastructure and kills livestock and people. 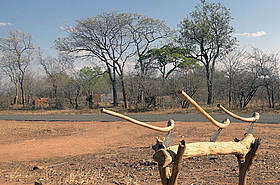 Biomass, mainly in the form of wood, accounts for most of the primary energy needs of Zimbabweans. It provides 61% of the total energy supply. Firewood is the main source of energy for heating and cooking with an annual household consumption of 4.2 tons. Deforestation is also increasing due to the rise in tobacco farmers who clear forestland for planting and use wood for curing. In 2008 the country had 744 rhino of which 144 were poached. Corresponding figures for 2012 were 710 and 93 respectively. Although the exact number of elephants in the country is unknown, the specie is not considered threatened compared to other African countries. With the third and fifth largest elephant and rhino population in the world respectively, it is not surprising that Zimbabwe finds itself at the centre of international ivory and rhino horn trafficking by sophisticated and well resourced poaching syndicates and networks. Global Climate Models (GCM) indicate that most of Southern Africa, including Zimbabwe, is likely to experience higher temperatures (2-40C higher than the 1961-1990 baseline) in the coming decades but the picture for rainfall is less clear. While average annual rainfall appears to have changed little over the last 50 years, droughts and floods have become more frequent and severe and the onset of the rains less dependable.